Abstract: In 1964, the major photo-exhibition What is Man? opened in West Germany before going on to tour the world. It was organised by the Austrian photo-curator and editor Karl Pawek in homage to Edward Steichen’s The Family of Man, which, frequently criticised as American cold war propaganda, had begun its European tour in West Berlin in 1955. If Steichen’s show purported to reveal the constancy of human nature throughout the world, and on each side of the Iron Curtain, using photography to offer its spectators a kind of post-nationalistic sense of belonging, Pawek’s – against his own claims as to its similarly optimistic and homogenous vision of humanity – made clear the complex and conflicted political nature of humanism and nationalism in post-war Germany. What is Man? contained many more explicitly politicised and violent images than Steichen’s exhibition, and juxtaposed images which told of far greater social and economical inequalities and political differences than suggested by The Family of Man. This paper will explore how Pawek transformed Steichen’s 1950s vision of equality and humanism. Looking at What is Man? in relation to the political, cultural and social context of postwar, cold war Germany and the aftermath of National Socialism and the Holocaust, it will offer a close comparative reading in relation to both The Family of Man and Ernst Jünger’s photo-book The Transformed World of 1933. If Jünger’s photo-essay strove to document a world redefined by mass politics and mass consumption, demanding and training a new kind of spectator and subject equipped for this world, this paper will ask what kinds of seeing, subjectivity and experience Pawek’s photo-exhibition strove to document and give form to. Abstract: During the 1960s and 70s, on the wake of social and political activism, several Italian artists based their work upon a multi sensory approach to photographs conceived not just as representations, but as material objects and social agents. Mario Cresci was one of these artists, and the peculiarity of his contribution lies in the work he did as a member of the cross-disciplinary collective Polis. Composed of Cresci himself, along with architects and urbanists, a sociologist and a local historian, the collective was hired by local authorities in 1966 to draw the master plans of two cities in Basilicata, a rural area in southern Italy strongly hit by emigration. The master plans were based on participatory urban planning and active citizenship. Cresci, who was trained as a graphic and product designer, defined himself as an ‘artistic operator’ directly intervening upon reality, acting within complex networks of relations among people, animals and objects. Distancing himself from the sentimentalist and aestheticising nostalgia of the Italian rural south typical of the work of photographers such as Cartier-Bresson, Cresci used his own photographs, as well as family photographs of sorts, as means to trace models of sociability strongly related to the identity of places and people. Though a constant dialogue among Cresci and the other members of Polis, photographs conceived as material objects with their social biographies were fully integrated into urban planning as research tools and as means of communication, as a way of encouraging historical awareness, building community identity, improving local economy, encouraging local craft. Abstract: Using a case study of the photographic activity in a Boys’ social club in London’s deprived East End, this paper examines the informal education offered by camera club membership. Mostly using basic box brownie cameras, these young boys were encouraged to gain skills in photography—including developing and printing—and to produce exhibition worthy photographs, as part of a drive for creative and absorbing leisure at the time. I argue that the practice of photography not only offered an escape from the overcrowded streets of the area, but it also provided club members with a set of skills that could help them to become engaged citizens in what was an increasingly photographic age. What was ‘touch’ in the 19th century and how did it operate in and construct the cultural and social field? 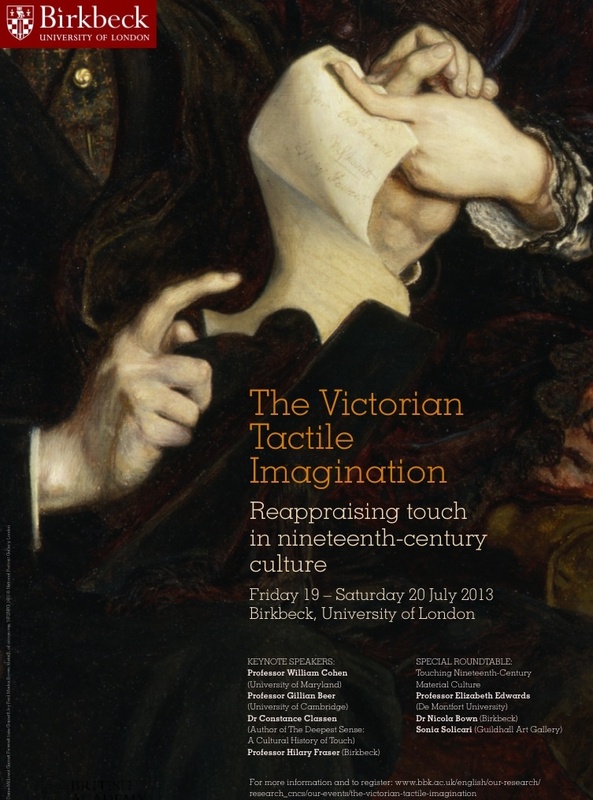 In July I was lucky enough to be invited to participate in the conference The Victorian Tactile Imagination: Reappraising touch in nineteenth century culture at Birkbeck College, University of London. It brought together scholars from many disciplines including literature studies, history, anthropology and material culture studies. Unfortunately I could only attend the last day because of other commitments, and so missed Professor Gillian Beer’s keynote which, as ever, would have been highly stimulating. But there was nonetheless much to engage me. What was striking was the way the photography resonated through so many of the papers I heard, for instance Sarah Parson’s on Notman’s studio practice or in Kathleen Davidson’s paper, on steroescopic views of natural history collections in the British Museum which linked visual and tactile in the viewing of stereos with the haptics of attentive viewing as the viewer is enfolded by the image. All the papers challenged the primacy of visual analysis even in its more embodied forms, typified and exemplified perhaps in Jonathan Crary’s Techniques of the Observer (1990). In their different ways papers addressed the way in which strategies of touch were used to draw the viewer into the image, what Lynda Nead described as “small gentle acts of gaze” drawn into the surface of the image. A number of the papers considered the ways in which touch and embodied practice drew people into the processes of photography itself, through the experience of the studio and its posing of subjects, while they were called upon to marvel on the effects of the medium. The tactile lure of photography was made even more explicit in Hilary Frazer’s plenary paper which argued the centrality of tactile metaphor in nineteenth century writing on photography, citing Talbot’ s anthropomorphising of the camera and the sense of touch of light on chemical and paper, and, read against the grain Julia Margaret Cameron’s and Lady Eastlake’s profoundly tactile sense of photography. My own contribution was to the final round table. We – Sonia Solicari, Nicola Brown and myself – were asked to take one object and discuss its tactility as a way of drawing the conference themes together. My object was a card mount carrying a label and a photography from the Photographic Survey of Surrey collection at Croydon Public Library (which everyone seemed to think was rather amusing – and I suppose after Cameron– it does inhabit a very different concept of history of photography). It was an object specifically designed to give access to photographs through ‘legitimate handling’ in the context of a pubic library. I have found this object extraordinarily rich to think with, so watch this space. The history of touch and touch in history are becoming increasingly dynamic fields of study. But the significance for history of photography of this conference was that it massively expanded the field and moved the theoretical base from photographic theory itself to explore, almost implicitly, how photography itself emerges as much a practice and metaphor for touch as for vision. Above all this conference, for me, expanded the sense of visual tactility at multiple levels. We have heard much recently about photography, emotion and the senses, for instance recent books by Margaret Olin and Patrizia Di Bello. However the ideas around at this conference, even if not specifically about photography, pointed to an expansive potential in how we might think about the tactile in history of photography.